At age of 7, Mr. Zhang started practicing Chinese musical instrument after his father who was a career musician The young Zhang performed and contested in numerous occasions as a child and had won many awards. At 11, he won the Grand Award in the First National Minority Musical Instrument Contest. At 15, he enrolled into Chinese Special Folk Art Academy, studied under China’s most respected Yuan and Liu Charm Master and composer Mr. Lin-Ji Liang. With his special talents and years of hard work, Zhang had progressed his Charm skills to an exceptional level. At the same time he mastered other instruments, including Ching Charm, San-Xiang (three-stringed lute), and Rewapu. 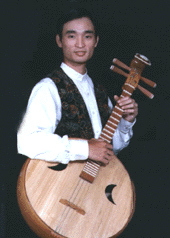 In 1989, he won the First Performance Award in the Chinese International Folk Instrument Contest. In 1990, he was selected as the solo performer in the China-the Beauty Art Performance Group, Sheng-Zhen, China. The Group went on tour to Hong Kong and Singapore many times and was extremely well received by the audiences in local communities. In May 1991, he received the Second Price in the ”Pear and Peach Cup” Art Performance Contest, Sheng-Zhen. In October-, he won the First Prize in the “Eagle City Celebration” Professional Art Performance Contest. In 1992, Zhang represented China in the International Folk Art Festival, Salt Lake City Utah, and was later invited to perform in a nationwide tour in all major cities throughout the United States. In 1993, Zhang was recruited to China-the Beautiful Country, the amusement park in Florida, as Adjunct Folk Artist, regularly performing in the art and craft programs. Mr. Zhang, in addition to his musical talents, is one of the few Chinese that can hand weave all kinds of miniature animals and objects with straws. The special craft was a well-kept secret in the Zhangs for centuries. Like his ancestors, Zhang inherited the handicraft from his father. His most noteworthy accomplishment was the replica of the ancient Nine-Dragon Dancing woven with his bare hands, a masterpiece that remains popular in the art circle in Beijing, China.